Purified water, Jojoba Oil, Cetearyl Olivate, Sorbitan Olivate, Caprylic/ Capric Triglyceride, Cetearyl Alcohol, Aloe Vera Extract(Organic), Glycerin(Plant Derived), Butylene Glycol, Hydrogenated Lecithin, Sodium Oleate, Oligopeptide-68, Sodium PCA, Cucumber Extract, Camomile Extract, Pantothenic Acid(Vitamin B5), Dipeptide Diaminobutyroyl Benzylamaide Diacetate, Tocopheryl Acetate (Natural Vitamin E), Xanthan Gum, Phenoxyethanol, Potassium Sorbate, Citrus Grandis(Grape Fruit)Seed Extract, Disodium EDTA, Rosa Damascena Flower Oil (Rose Oil), Gananga Oporata Flower Oil (Ylang Ylang Essential Oil). 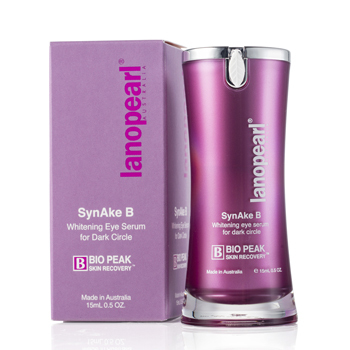 Take 2-3 drops of Synake B whitening serum on your finger tips and gently apply around the eyes, ideally twice a day. If you notice tingling sensation this is normal due to nature of active ingredients. If irritation persists, stop using it and consult your doctor immediately.